I grew up with Santa Claus, clear through 2nd Grade, he was just as real in my life as the Lord, Jesus Christ. I had an awesome childhood: my folks loved (and still do love) me, I had powerful worship experiences Christmas Day and Christmas Eve with my now-passed Grandmas, and we talked about Advent and Christmas' meaning. That's not why I want something different for my kids. I want something different for my kids because it's possible to give them an even greater, deeper faith now; as they understand Christmas from their very young perspectives as most people don't get to experience it until much older. I want to be clear that I don't condemn parents who choose to share the Santa myth with their kids; it's fairly benign, neither positive or negative in many respects. I don't think you're going to screw up your kids if you raise them with Santa Claus as part of the Christmas story. I just think that omitting Santa, can bring so much MORE. So what am I doing? We have two kids, Ann(age 3) and Benjamin(1). Both obviously very young , so they are VERY impressionable. Ann in particular, uses the word, "why," dozens of times throughout the day. They have lots of questions about everything, and we answer them as honestly as we can. So, this advent season, I'm answering her questions honestly. Her Mom and I buy her presents because we love her. She can "buy" presents for people she loves too. Christmas is Jesus' birthday. We're having cake. As to the Santa question? I'm being honest there as well. 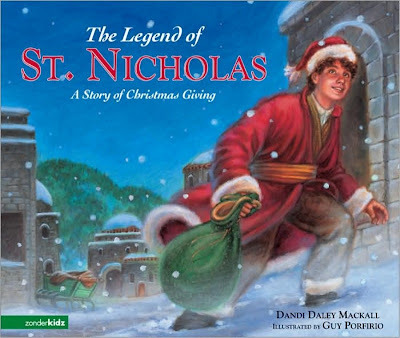 We're reading The Legend of St. Nicholas, by Dandi Daley Mackall. We've read it 3-4 times now, and I'd like to keep at it as long as she's interested. My hope is that Ann will keep asking questions until she works out the logic of Santa on her own. I'll keep prodding her in that direction, but I really want it to be her discovery. As to Ben, the thought is he'll never know any different than to accept Santa as a silly story for kids who don't know about Jesus yet. Personally, Advent has been an especially important season for me this year, as I try and turn the introspection of the season and what it means to me, into a tangible, extrospective response. I'm doing this in lots of ways, but certainly with my family near the top of the list. For what it's worth, I do have my concerns. Pamela is an awesome Mom to our kids and has greater reservations than I do about the anti-santa business. She wants our kids to love and be loved by others, which may be a bit harder if our kids start spoiling it for others. In the long run though, I think the coolest result would be if our church took up the mantle of Christ in our kids' lives, and lots of families came to the same conclusion. I've never seen that particular book, but have seen others of hers. Now I'm curions. I did once met Dandi Daley Mackall at a conference and think she's wonderful though! The Santa question is a tough one, and I know I don't have all the answers, especially as my 7 year old niece has already figured things out this year. I just know that I appreciate when people teach their kids to keep the focus of the holiday about Jesus, regardless of Santa. Growing up and still today, my favorite Christmas decorations have always been kneeling Santas, where Santa is kneeling at Jesus' manger, remembering that JESUS IS the reason for the season.